This challenge was quite unusual, yet very inconvenient for the researcher’s staff scientists. After solving PCR issues described in PCR Success Story #3, #4, #5 and #6 using Transgen Biotech’s DNA polymerases, we encountered a different type of problem. This well established lab located at the Centre de Recherche du Centre Hospitalier de l’Université de Montréal (CR-CHUM) was convinced something was contaminating the air as the were unable to perform Human gDNA Quality Control by PCR or any type of PCR in their own lab. They had been using Lucigen’s EconoTaq.for over one year. 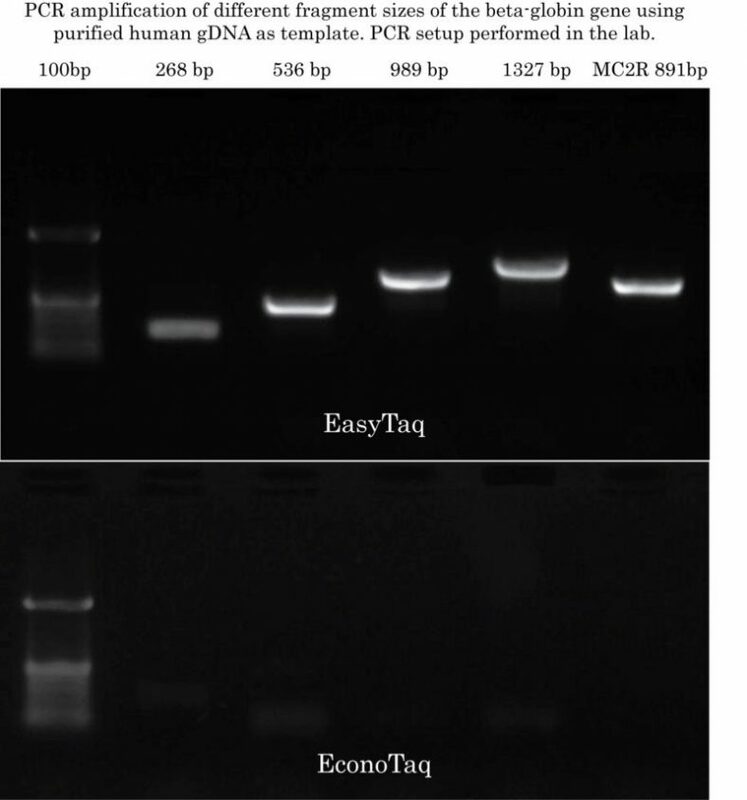 Their lab performs regular gDNA extraction and purification from human blood and perform a quality control assay that consists in PCR amplification of different fragment sizes on the human β-globin gene. Please find bellow what we have accomplished using Transgen Biotech’s EasyTaq DNA polymerase. This project was exciting!? 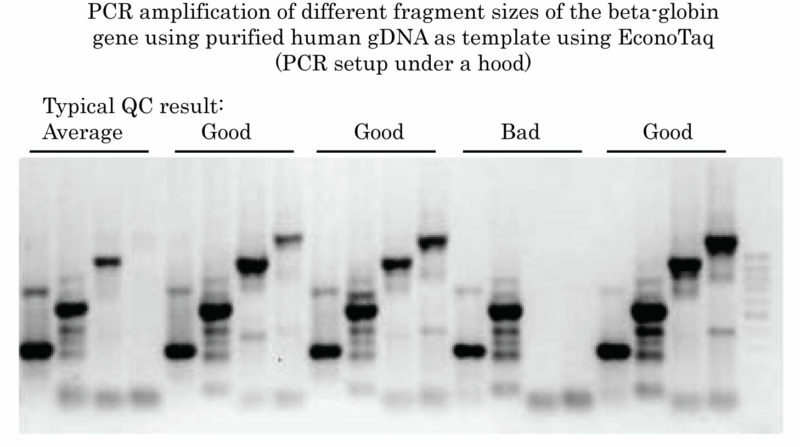 PCR setup for Human gDNA Quality Control needs to be performed under a hood! EasyTaq ''resists'' to air contaminants (if any)! We went into the researcher’s lab located at the CR-CHUM in Montreal. We brought our own water, dNTPs, EasyTaq and a set of control primers to amplify full-lenght human MC2R from the researcher’s purified gDNA (we had previously validated the customer’s gDNA in our own lab), We set up the PCR reactions in their lab for EconoTaq Human gDNA Quality Control using their tips, tubes and pipettes and left the tubes )mastermix and reaction tubs) opened the entire time during the reaction setup. Primer and DNA dilutions were freshly prepared using our ddH2O. EasyTaq was compared to EconoTaq. On the next day, the researcher migrated the PCR reactions using their own equipment and in our absence. This is the result of the EconoTaq Human gDNA Quality Control that was obtained. Which DNA polymerase would you buy? !